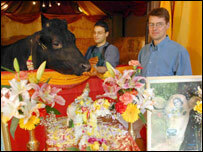 A Hindu educationalist has said that monks protecting a "sacred" bullock due for slaughter after a positive TB test have interpreted the religion wrongly. Jay Lakhani told BBC Radio Wales Shambo should be put down for the "greater good" and that farmers had considered that wider picture. The credibility of the religion had been put on the line by the actions of the Skanda Vale monks, he said. Their interpretation of Hinduism was "naive" and "simplistic" he claimed. The monks at the multi-faith settlement near Llanpumsaint have fought their campaign - both in the media and in the courts - since the six-year-old black Friesian's bovine TB test returned positive in April. The monks have said they regard Shambo as sacred because of their Hindu religion and as such he should not be slaughtered, which is usual course of action taken when such an animal tests positive for TB. But Mr Lakhani, who is the co-author of the book Hinduism for Schools, said his opinion was this interpretation was "seriously wrong" because it did not take into account the "greater context in which we operate" as Hindu teachings do. "If the life of one animal may endanger other lives or human lives as well, then we must take into account the greater good and sacrifice the individual good," he said. "(The Hindu religion) says that it is necessary sometimes to use violence in order to uphold the greater good." Mr Lakhani claimed that farmers, who he said had been paying a heavy price in order to curtail the disease, were better practising Hindus than the monks at Skanda Vale because they considered the greater good over the individual good. He also criticised The Hindu Forum of Britain for turning a "local issue" into a major story and making thousands of Hindus feel their religion was at stake unless they stood up for Shambo. While Mr Lakhani agreed that the cull would be "very sad" he urged the Skanda Vale monks to allow Shambo to be slaughtered. "He should be sent away with full pomp and glory saying that this life has been sacrificed for the greater good," he said. "The money that the brothers have collected and used for fighting the legal battles should be given to the local RSPCA in order to alleviate the sufferings of perhaps thousands of other animals." Welsh Assembly Government officials who earlier arrived at the temple to take Shambo for destruction, were turned away by brothers because they said they did not have a warrant. The monks and hundreds of their supporters have been protesting outside the temple in which Shambo is housed, isolated from other animals.